Research has shown that women led businesses achieve lower levels of funding than their male counterparts, with male entrepreneurs 86% more likely to be venture capital funded, and 56% more likely to secure angel investment. However evidence suggests that female enterprises are performing stronger than male dominated companies. Funding female startups is a huge issue. As two female entrepreneurs – it is also an issue that is close to our hearts. 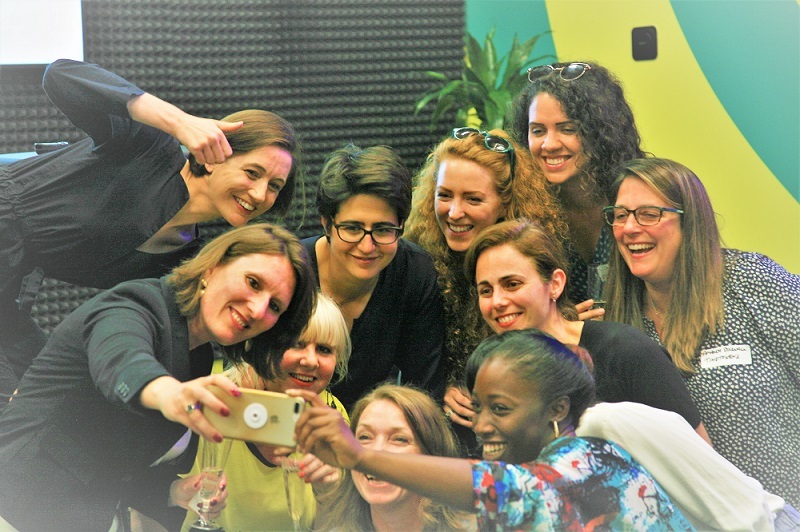 As part of Gigglebyte we launched a search to find 9 female entrepreneurs to take part in our Stand Up and Pitch event, because being able to pitch your startup clearly and with impact is essential. At an early stage, investors invest in the founders and entrepreneurs need to show that they are a trusty pair of hands for their investment. Our selected entrepreneurs would take on our investor panel to win prizes to help their business take the next step. Sounds simple enough, but this was Gigglebyte so we needed to add the funny! We brought in Sarah Archer a stand up comedian and business coach to deliver a pitching workshop for our entrepreneurs, to enable them to pitch with impact and passion. TimeTokens is a brand which specialises in personal development products for families. Timetokens first product is an award winning parenting tool which empowers the under 10’s to manage their screentime. The Blues Project is a unique digital promotion platform for emerging musical talent. TheBluesProject.co is a thriving online community around a specific genre of music – contemporary, new-age Soul music – and provides monetisation opportunities for artists in the genre. Sensethefuture Pictures is a television and communications business with global reach. Sensethefuture Pictures works with emerging and established talent to produce communications fused with storytelling that are both entertaining and thought-provoking whilst appealing to a broad audience. No Fixed Abode of London is an innovative international streetwear company, producing collections of clothing and accessories. They design and produce fashion garments of luxury quality for people that like to be different, get noticed, the rebels, the individuals, the pioneers of change. 2080 is reviving the £7bn of child trust fund money, engaging young people in their money, the world and their future. OHNE is a 100% organic bespoke tampon subscription service. OHNE is shaking up the menstrual hygiene industry and changing the way women shop for tampons. OHNE was born out of a passion for women’s health, an anger at the inequality and irony that sees women in the UK being sold unlabelled, pesticide sprayed products while women in many parts of the world can’t access any at all. DanceWest is the community dance organisation for West London. Engaging 29,000 people a year in high quality dance activity that improves the mental, physical health and wellbeing of communities. We believe that dance has the power to change everyone’s lives and everyone should have access to it. VeeLoop is a simple, frictionless service that solves the main problem preventing teens from shopping online – removing the need for payment cards. We enable teens to shop online safely and independently whilst giving parents full visibility and control. Ginza is a digital hotel concierge that provides luxury and boutique hotels with city guides and unique, bookable experiences, curated by local insiders specifically for the hotel’s brand, location and guest profile. Our female entrepreneurs spent the afternoon with Sarah to finesse their pitching skills. Sarah was once a HR manager fully immersed in the corporate world. That was until she gave stand up comedy a try. The impact that stand up comedy had on her corporate job was clear. Her new found confidence saw her being pushed forward in her career and promoted! She now uses the skills she has learnt to help entrepreneurs gain the confidence they need to succeed! Sarah taught our entrepreneurs the importance of making sure their message was clear, that they told their story and they left the panel wanting more. The workshop was a great opportunity for our female entrepreneurs to get to know each others stories, learn from one another, and form new business connections. After several run throughs, heaps of support and advice, our entrepreneurs were ready to face the panel….. Read our next blog to find out how the evening went!